ProfessioNAIL Gel Colour is the best. See ProfessioNail about gel colour. New from ProfessioNAIL – Colour Gels. The best gel system we have ever worked with! 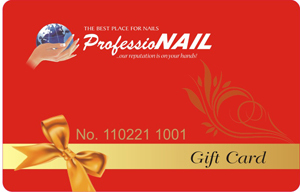 And not just us but other technicians too- we have received RAVE REVIEWS from nail technicians all over North America, Europe, Australia and Asia! With our 3 Tier Gel System you will be able to build strong, beautiful nails without the hassle of primers, odors or excessive dust. It cures leaving a sticky layer. Use as a first step prior to applying Overlay Builder Gel. A slightly pink, high viscosity, no run gel for creating a strong and resilient nail. Apply one or two layers depending upon your style of application. It cures to a slightly dull but incredibly hard finish. Wipe and file to perfect the shape of your nail. File but do not buff! No need to. You will now follow with a thin application of Shine and Seal Glossing Gel to smooth over, seal and gloss your nails. A pink, medium viscosity gel to apply as a final coat on top of your sculptures and overlays. It cures with the most glossy, brilliant and durable finish available. Compare this to any gel, any where and you will see something amazing! Shine and Seal Glossing Gel will not only seal and shine your gels but it can also be used on top of acrylics as well! Just apply, cure and wipe. Its that simple.